I am at my wit’s end. I have been trying to get my 19 year old son to get a job for months now. He says he’s trying, but I can’t be sure, as I am not home during the day to supervise him. I also just found out that he has been lying to me about finishing his high school diploma online. I try to motivate him to get a job, but he just doesn’t seem to care. He’s not a bad kid. I just find that I am starting to resent working so hard to put a roof over his head when he is doing nothing all day, and then lying to me about it. What can I do to make him care? It may be small comfort, but you are certainly not alone — we hear from so many parents in similar situations through parent coaching. You have worked hard to provide for your child, and expect him to take some responsibility for himself, and to care about becoming independent. But the truth is, most teens don’t think that way — they aren’t yet motivated by the same things adults are. As James Lehman said in his article on Motivating the Unmotivated Child, your teen is motivated — he’s just motivated to do what he wants, not what you want. If you think about it, why should your older child follow through with work or school? If he can live at home, be warm and fed, and have no adult responsibilities, why would he want to change that? With that ideal situation at home, there is no reason to face the challenges and anxieties of becoming an adult. Instead of trying to get your child to care about work or school, you may have more success if you focus on the rules and expectations for him continuing to live in your home. Spend some time thinking about your expectations, and what the consequences will be for not following those expectations. Choose consequences you will adhere to — it will not be effective if you tell your child he can’t live in your home without a job and he is still there, jobless, 3 months later. Sit down with your teen and let him know what you expect; be clear and direct with your expectations, such as: “You have two weeks to find work; if you do not find work within those two weeks, I will find you a volunteer job. Either way, you need to be working — either volunteer or get for pay — 15 hours a week in order to continue to live here.” Remember, if there is no consequence for not following your expectations, your teen is unlikely to change his behaviors — it’s too easy and too comfortable where he is. Your consequences should make him uncomfortable enough to change his actions. Holding him accountable lets him learn the skills he needs to become an independent adult. As James mentions in his 3 part series Rules, Boundaries, and Older Children, many teens lack the practical skills to assume adult responsibilities. Their anxieties about becoming independent may keep them from making an effort to find, or keep, a job. For many teens, putting up with mom or dad’s constant pressure is easier to handle than actually putting themselves out into the world. Rather than lecture your child about the benefits of working, focus on the skills your child will need to become a successful, independent adult. 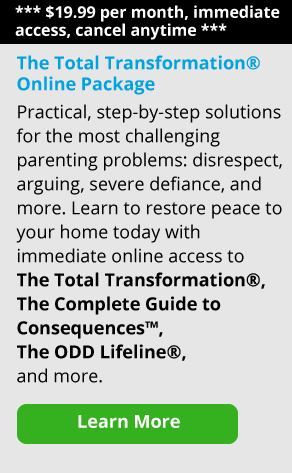 Use daily consequences and privileges to help your teen practice those skills. Don’t assume your child knows what steps need to be taken — break it down with him: “Given that you have two weeks to find work, we need to come up with a daily schedule — you will need to get up in the morning, get the paper (or look online), and put in three applications a day. When I see evidence of those three applications when I get home in the evening, you can have your computer. If you have no evidence, you don’t get the computer, and you can try again the next day.” Breaking the larger task of finding a job into manageable, daily steps increases his practical knowledge, and it can help to keep both you and your child from coming up on the deadline with no effort made. Combining daily requirements and longer term goals can help your child successfully follow the rules in your home — and be on their way to independence. And, as James says — don’t hold your breath waiting for your teen to appreciate your efforts, or for him to suddenly want to work. These things come with age and with time. Keep your focus on tangible, practical skills and goals, use privileges your child values, and follow through with your consequences. For more on helping your teen transition from child to independent adult,? be sure to check out the three part series Rules, Boundaries and Older Children.